WASHINGTON A doctor says an American man imprisoned in Cuba may have a cancerous growth on his shoulder, contradicting the Cuban government which has said his health is normal. 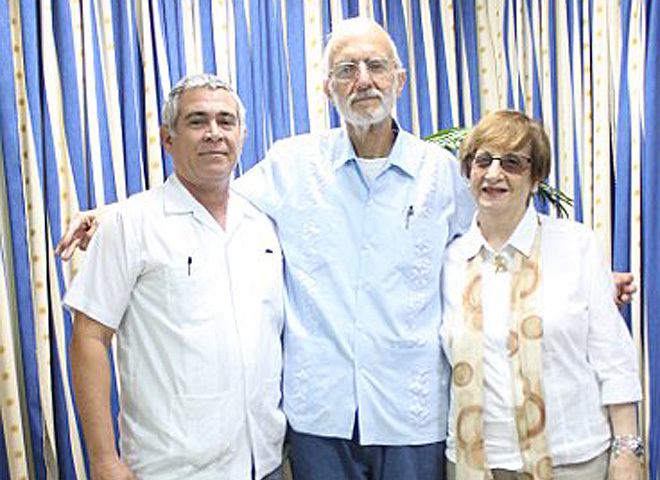 A lawyer for the imprisoned man, Maryland native Alan Gross, said Tuesday that a U.S. physician came to that conclusion after reviewing medical records sent by Cuba. The doctor said the mass that appeared more than five months ago behind Gross' right shoulder must be assumed to be cancerous unless proven harmless. Gross, 63, has been in prison in Cuba since late 2009. He was working as a U.S. government subcontractor when he was arrested, and his case has become a sticking point in U.S.-Cuba relations. A senior Cuban diplomat, Foreign Ministry official Josefina Vidal, said in September that Gross's health "continues to be normal and he exercises regularly." But Dr. Alan A. Cohen, a Maryland radiologist who reviewed medical records sent by Cuba, said in a statement released Tuesday by Gross' lawyer that some of the studies were mislabeled and that the mass "has yet to be properly evaluated." He said it would be preferable if Gross was immediately examined at a facility in the United States. Messages left early Tuesday with Cuban government officials in Havana and a spokesman for the Cuban Interests Section in Washington, which Cuba maintains instead of an embassy, were not immediately returned. Gross' lawyer, Jared Genser, said Cohen's review was sent to the Interests Section by email Monday. Genser also released a statement from Gross' wife, Judy Gross, in which she asked Cuban President Raul Castro to allow her husband to be examined by a doctor chosen by Gross and his family. She and her lawyer have made the same request before. "President Castro, I beg you not to let my husband die on your watch," Judy Gross said. "Your country claims to have such a wonderful health care system  yet why have your doctors misdiagnosed him and failed to order the right tests to determine what is actually happening?" Gross is serving a 15-year prison sentence imposed by a Cuban court in March 2011. The sentence stems from his work importing satellite and other communications equipment into the communist country as part of a democracy-building program funded by the United States Agency for International Development. Cuba considers such programs to be attempts against its sovereignty.